Exit I-95 at exit 8 for US 278 toward Hilton Head Island. Travel approximately 15 miles, crossing the bridge over the May River onto HHI. Stay right on 278; do not take the Cross Island Parkway. After passing the entrance to the Cross Island Parkway proceed approximately 1 mile, turning right onto Indigo Run Drive. Go to the gate house, receive your entry pass, and drive to the fifth right turn, Golden Bear Way. Club is 1/4 mile on the right. The practice complex includes a driving range, bunker practice & chipping area, and a large putting green. Instruction available from 2 PGA Class A pros. Comments - Golden Bear at Indigo Run is highly-regarded by, and a local favorite of the golf community on Hilton Head Island. Golden Bear Golf Club reaches just over 7,000 yards at the tips, but most visitors will have plenty of challenges at either 6,643 or 6,184 yards. Created on a fairly flat terrain, with little natural mounding, the Nicklaus Architectural group relied primarily on ponds, marsh and the forest to carve a challenging, yet fair test of golf. Ever-present water and sand keep play interesting, but never penalizing... golfers will find the course puts a premium on strategy and finesse, rather than sheer power. Winding through a beautiful landscape of oak and pine woodlands, the Golden Bear is a fitting complement to the prestigious residential community of Indigo Run. 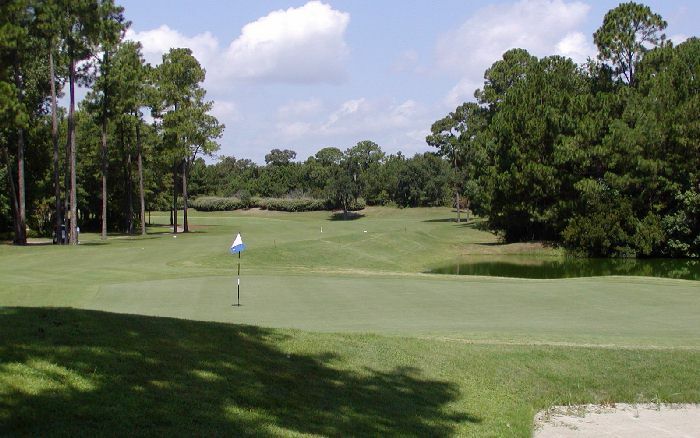 Located just on the main island of resort area of Hilton Head yet close to all that the island has to offer, the Golden Bear at Indigo Run is one of the must play courses when visiting Hilton Head. Golden Bear made Travel and Leisure's list of the "Top 100 Value Courses" in America. Visit Golden Bear's sister course, Country Club of Hilton Head.